Danielle Vanier: Roll Up, Roll Up. Shock! Horror! I have deviated from the 70s and actually managed to put together an outfit that isn't inspired by that era but by the 90s instead! This cute little summer *Midi Dress is beautiful but sadly with our British summer being as hideous as it is; I can't see myself wearing it any time soon. 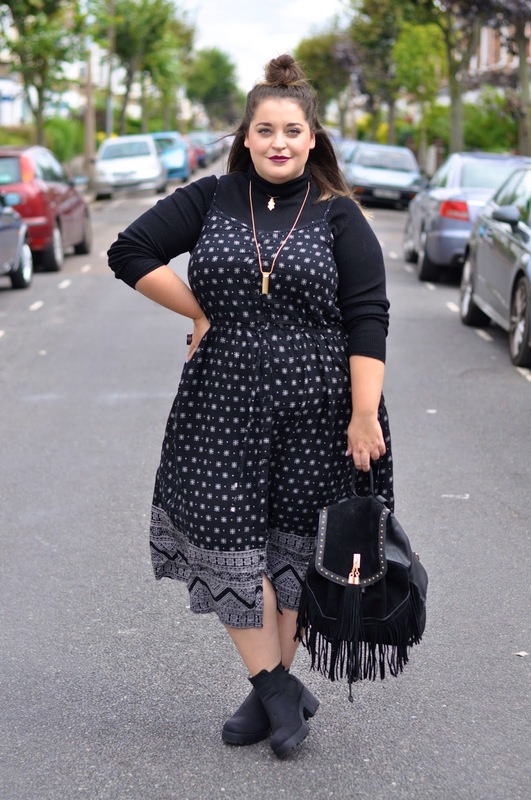 Whilst sitting on my bed and day dreaming, I had one of those light bulb moments and realised I needed to add an autumn twist to the dress so that I could continue wearing it well into the winter. Adding a roll neck underneath a simple strappy dress instantly updates it and can take you from summer to winter in a blink of an eye. Add chunky boots, some pendant necklaces and a leather jacket (if it's really nippy) and you're laughing! Without realising it, I had styled a very 90s inspired outfit when I put all this together and I think the half up/half down hairstyle or "The Hun" as it is now known and the dark lips finish the look off well. Earlier this month, I attended a beautiful dinner hosted by Fashion Chick and we chatted the night away, ate scrummy sushi at Kouzu and they gave us the best goody bags, brimming to the top with goodies from Miss Selfridge, New Look, Boden and more. This cute lil New Look dress was part of my selection and now I've found a way of wearing it during these chilly months; I can tell I am going to wearing it a lot. Beautiful look! I do this to my summer dresses too - such a good tip to make things appropriate for all seasons. I just bought this dress for a late holiday so glad iv seen you transform it! !